Air sealing is the process of reducing the amount of air that leaks in and out of your home. It is an important step to reduce energy costs, reduce drafts and cold spots, help keep out pests and allergens, and increase the overall air quality in your home. Air leakage occurs when outside air enters and conditioned air escapes your home through cracks and openings. For years, it was believed that air leaks created proper home ventilation. Today’s building science proves this isn’t the case. Uncontrolled air leaks can cause too much or too little air to enter or leave your home. Either situation can result in poor indoor air quality. Although air sealing is a very important part of home energy efficiency, it doesn’t eliminate the need for proper insulation. Foam insulation is a perfect solution to both insulate and seal air leaks. 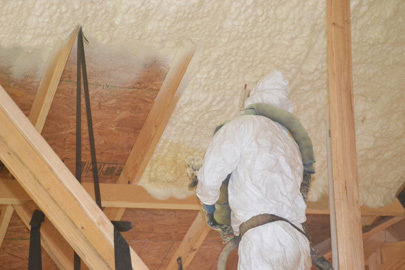 Foam insulation expands when applied and completely fills a cavity. The product is applied as a liquid and expands to 100 times its volume. This means that the product fills cracks and crevices in a cavity, and expands to seal these gaps. Your home is insulated and air sealed with one application!